I was actually working on a blog post for tomorrow, when I was distracted by Pinterest and decided to write this Party Planning post. This always seems to happen! I get sucked into Pinterest, admiring all the crafty and creative ideas that are shared there. I wish I had the time to do half of the DIY stuff on there, but I don’t. So with the help of Pinterest, I have found some easy and unique ways to use balloons for a party, without a helium tank. 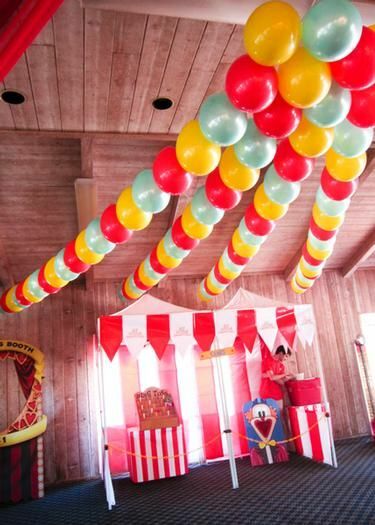 Below are my favorite ideas for easy balloon decorations. All you need is tape and ribbon, and in the case of the balloon garland a sewing needle and string. You also don’t have to be a super creative or a crafty mom for these. 🙂 Enjoy! Inexpensive plastic tablecloths, balloons, and ribbon. Jessica Schlecht made this creative balloon avalanche for her 5yr old’s birthday! 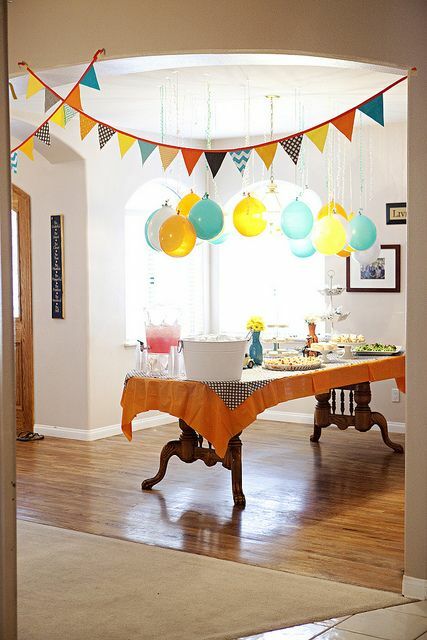 Hang balloons from the ceiling with ribbon and tape. Put a penny inside the balloon before you blow it up, so the balloon will hang better. A simple & colorful backdrop. 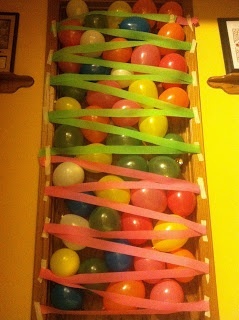 All you need is balloons, streamers and some tape. 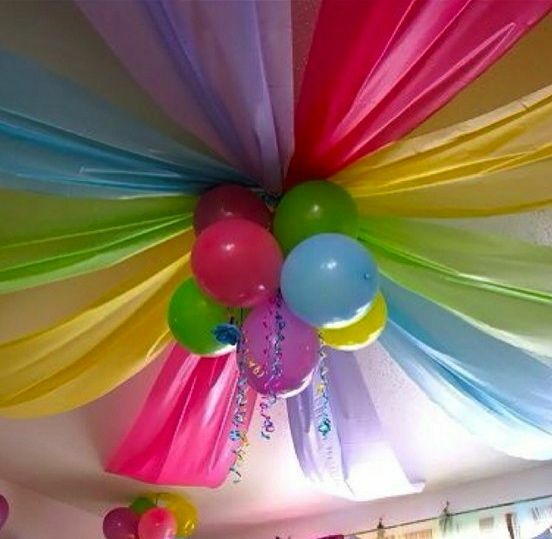 Balloon Garland: Take a needle and some thread/yarn and sew it through the balloon necks. 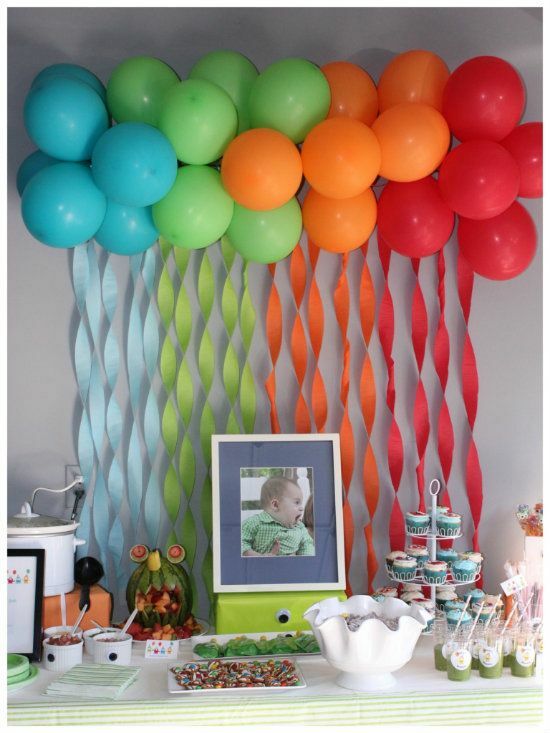 After you’re done stringing the balloons just hang them up with tape or thumbtacks. 1 reply to Party planning: Decorating with Balloons without helium. Wow the declarations look so amazing. What a great job you did.